Support the foot and ankles while maintaining a professional look with 5.11 Tactical's Men's ATAC 6" Side Zip Boot (12018). 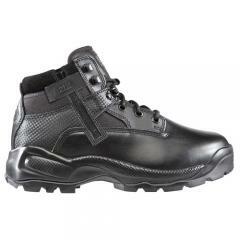 The boots are crafted from full-grain leather and offer a toe that can be polished to a proper shine, meeting most agency standards for uniform wear. 5.11's trademark Shock Mitigation System® provides impressive foot support and stability for lasting wearer comfort. A moisture-wicking lining wicks away sweat and added moisture for enhanced dryness, while the antibacterial treatment prevents the buildup of odor-causing microbes. The outsole is oil and slip-resistant, guaranteeing traction regardless of terrain. The ATAC features a 6-inch ankle height with a side zipper for rapid and effortless on/off. Extremely comfortable well fitting boot's, even after 10 hour shifts right out of the box. Sizing is spot on. Snug but comfortable for long term use. I suggest the 511 tac socks.